Better punny subtitles are available. Nintendo's next mobile game is Fire Emblem Heroes, a proper mobile title (i.e. there are microtransactions to buy (yes!) heroes) that'll appear on Android and iOS at the same time, it transpires. Definitely going to give it a pop. I'll be downloading this for sure. A fire emblem lite should be a perfect fit for the mobile platform. I've always viewed the FE series as an rpg first but the game does play out like a bit of a puzzle. I could see them perhaps emphasising that aspect of things with bonuses for winning in fewer turns or something. Anything that'll give a little extra challenge or variety to something that might not have so many units on screen compared to the traditional games. I'd be happy with that if that's something they implement. I'm still not sure exactly where I stand on this, trailer was very Awakening/Fates heavy, but that could just be to appeal to all the newer fans. I hope they do have a good selection of older characters & the choose your hero website isn't holding anyone back at least. Guess I'll just wait and see! I've got a feeling this might get a bit irritating and free-to-play, but I'll definitely download it and have a good time mucking around before it turns expensive. For a mobile game it does look good and I'll give it a go as who knows as playing this under My Nintendo may unlock something in Warriors if all linked to the same account. I hope they have a way to earn the currency to unlock the heroes relatively easily in the game. I suspect they won't as this does seem the most F2P typical mobile release from Nintendo yet, but I trust they'll keep it balanced enough so that you don't hit a brick wall with having no currency for new dudes and dudettes. Basically, so long as I can get Haar and Rolf on my team, I'll be happy. It's free to play so it's worth a shot, could perhaps usurp Pokemon Go as my Mobile game of choice what with there still being no proper Gen 2 update yet. I certainly won't be spending any money though because I'm as cheap as I am patient. The Choose Your Legends event is open... although still not entirely sure what it's meant for. Still, I'll happily take an excuse to help spread the word about how awesome Haar and Tibarn are. The current poll rankings have been released. Some largely expected results and a few surprises in the mix, particularly the Sacred Stones duo who are backed by neither Smash Brothers exposure nor memes. 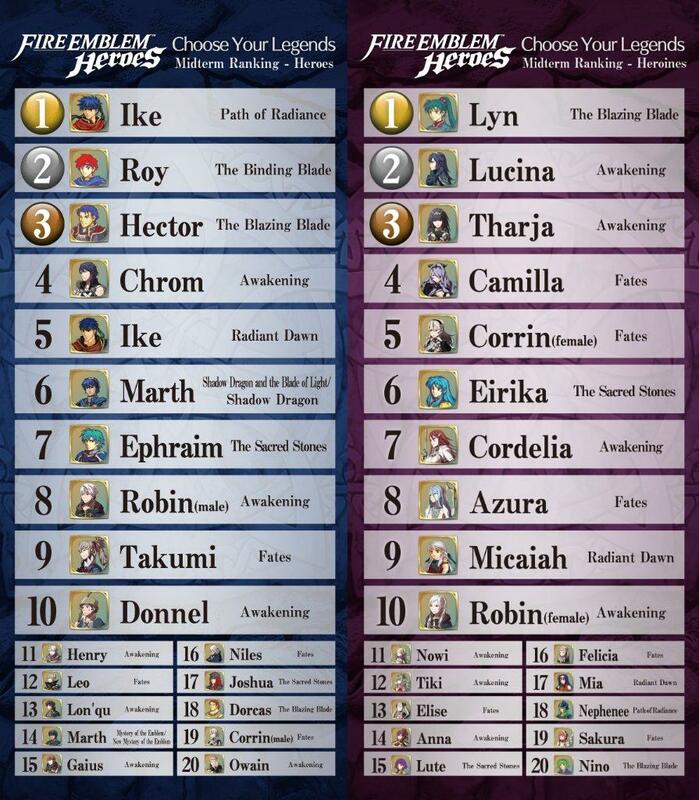 At least Male!Corrin is where he belongs, only thing he's good for is female!Kana. That just reminded me Nephenee existed - she's got votes coming her way. I've just hit Chapter 3, really enjoying it. Why the hell have we got Friend Codes when My Nintendo was meant to bring a universal system, anyway my code is 0013571322. I'm also enjoying it a lot, although it's definitely the most typical mobile game out of Nintendo's offerings thus far, what with "energy" and microtransactions. Having said that, I did use some saved up Google Play Credit and bought some orbs... I got a five star Nowi. I hate Nowi, but she's easily my best character now. Used my orbs right off the bat and My only decent summon is 4 star Felicia who is doing real well. I'll be getting this tonight, so friend code incoming, but you've got to imagine that Nintendo do want us to buy orbs. It's a free game with microtransactions: they want our money. It's not a complaint - just my humble, unsubtle and often wrong opinion rearing its ugly head. Mirroring the thoughts of others, I've enjoyed this for the most part. I'm super impressed by how well the thing runs too. That said I'm not sure I'll be sticking around for long. I've not had much luck getting heroes and unfortunately I'm not sure the currency rewards are quick enough or efficient enough to keep a free player going. I know Nintendo need to make dollah off this, and there's a certain amount of artistic pride they must have in avoiding ads, but the price of orbs is ridonks. It's like £12 for enough to roll for a set of 5 new heroes, yeish. 5 star Roy, 5 star Camilla, 5 star Tiki and 4 star Robin. I've also got 5 star Nowi and 5 star Lyn, but they're too similar to Tiki and Roy respectively to get a proper spot in my squad. There's no such thing Jay as Robin doesn't go below 6 stars. Something something Tenderloin Minimise something something. In other news, I'm on! I have 'drawn' Draug, Oboro and Lissa. I know nothing about any of them. My Friend Code is 3415769573 and I'm adding all o'y'all right about now. Oh my gotch, forgot about friend codes. Mine's 9263715887. There's definitely enough orbs on offer for a few free full hero rolls, true, but my luck has been quite poor. I actually restarted the after getting to about chapter 4 on day 1 because I managed to obtain 2, 4* heroes. This second time has been much better in terms of pure ratings, 5* Catria complimented by 4* Chrom, Cain, Merric, and Fae, but they're not really a cast I like too much. I got all of those bar Chrom in my opening summoning though, my second summoning was otherwise all bronze rated guff. That felt bad, and I hadn't the stamina to get back into the fray to get some more orbs which made it doubly bad. Anyone know if there's a mechanic in place like Hearthstone, wherein you were guaranteed at least 1 rare or greater card per pack, in Heroes? I think it's more like Overwatch - the longer you go without pulling a five star hero, the more likely it becomes to get one. I've heard that said about overwatch, but I think that's only true in the sense of, you're statistically more likely to get a given outcome, e.g. roll a six, the more rolls you make, rather than each individual roll itself having a higher chance of being a 6. So the odds of getting a legendary item on loot box 1 are the same as loot box 12 regardless of the results of all boxes in between. I don't think blizzard actually weights their system such that the odds of an individual box having legendary stuff goes up the longer anyone goes without hitting it big. Although I'm pretty sure that, like hearthstoner, you are guaranteed at least 1 rare item in overwatch loot boxes. That's why I'd hope heroes has a similar guarantee, especially considering that unlike hearthstone or overwatch, there doesn't seem to be an in game currency system that lets you either craft or buy with freemium currency, a specific hero.